Vivaldi gives you a free webmail account at Vivaldi.net. No ads and no strings attached. To log in, use your Vivaldi.net username and password. The best way to move all of your emails from your current provider is to set up your email client (e.g. Opera M2, Thunderbird, etc.) with both Vivaldi.net webmail and your current email providers account using IMAP. Once you set up both, you can move emails from your current mail provider’s IMAP folder to Vivaldi Mail IMAP folder. After you move all the emails, you can use the Vivaldi.net webmail web interface. If you want to move sent emails, don’t forget to move the email in Sent folder or similarly named IMAP folder. After the migration, you can also configure your email provider to forward all incoming emails to your Vivaldi Mail address to avoid checking multiple accounts. To add someone, who has sent you an email, click on the ‘Add to the address book’ icon between the sender’s name and the email’s date. 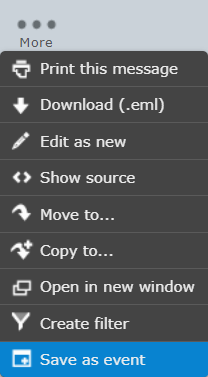 On the Contacts page, click on the ‘Create new contact’ button at the bottom of the Contacts column. Contacts can also be imported from vCard or CSV files. While composing a new email, contacts from the address book can be added to the email by typing in some part of the contacts name or email to the recipient’s field or from the Contacts column on the left by selecting a contact and clicking on either the To+, Cc+ or Bcc+ button at the bottom of the page. Emails can be saved to the calendar as events from More > Save as event. Events shared with you can be saved to your Calendar by clicking on the small downward arrow next to the attached event file and selecting ‘Save to Calendar’. Events can be sent to others by opening the event and selecting Send from Options. In Vivaldi Mail all emails need to be delivered to and sent from [email protected] This means that different aliases, unfortunately, can’t be used. But, if you have set your Vivaldi Mail up in a mail client, you may use plus addressing (also known as sub-addressing). With plus addressing you can add a keyword to your email address ([email protected]) which allows you to create different variations of the email address. Everything between the + and @ symbols is ignored when deciding, to which account the email belongs to. You can also create Filters with these addresses to automatically organize your emails into different folders. Filters are a good way to automatically organize your mailbox. In Vivaldi Mail you can create filters, for example, to move incoming emails to a specific folder, to forward them to another email address or to reply with a predefined message. To create a filter go to Settings > Filters. You can create and edit groups of filters under Filter sets. To create a new filter click on the big + icon at the bottom of the Filters column. Add a filter name, make a rule and decide what sort of action should be executed. Don’t forget to save the filter. Share your public key with the person(s) you want to have encrypted conversations with by attaching it to an email. And save PGP keys sent by others, by clicking on “This message contains attached PGP key(s)”. When composing an email, check the boxes for Digitally sign this message (asks for the account password) and/or Encrypt this message (see the image in the 3rd point). 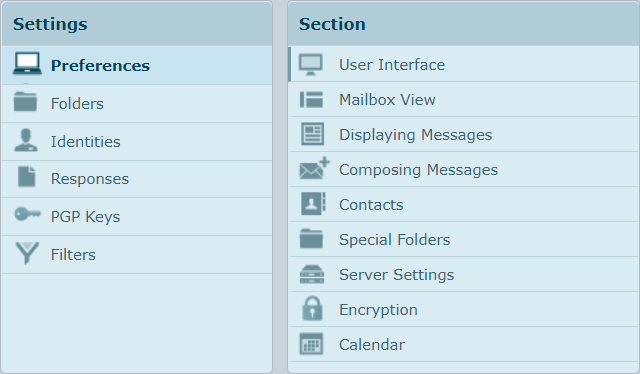 Numerous additional options to customize the mailbox and its features can be found in Settings. In case you can’t access your account, check out our suggestions here. If you didn’t find an answer to your question in this article, don’t hesitate to contact us. Select ‘Vivaldi.net account and services’ under ‘I need help with’ and describe the issue in as much detail as you can.